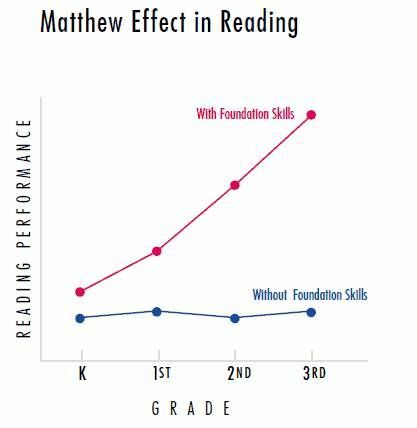 The Matthew effect in education was described by Keith Stanovich based on the Matthew Effect in sociology. It derives its name from a passage (Matthew 25:29) in the New Testament: "For unto every one that hath shall be given, and he shall have abundance: but from him that hath not shall be taken away even that which he hath." Stanovich used the term to describe a phenomenon that has been observed in research on how new readers acquire the skills to read: early success in acquiring reading skills usually leads to later successes in reading as the learner grows, while failing to learn to read before the third or fourth year of schooling may be indicative of life-long problems in learning new skills. This is because children who fall behind in reading, read less, increasing the gap between them and their peers. Later, when students need to "read to learn" (where before they were learning to read), their reading difficulty creates difficulty in most other subjects. In this way they fall further and further behind in school, dropping out at a much higher rate than their peers. "Slow reading acquisition has cognitive, behavioral, and motivational consequences that slow the development of other cognitive skills and inhibit performance on many academic tasks. In short, as reading develops, other cognitive processes linked to it track the level of reading skill. Knowledge bases that are in reciprocal relationships with reading are also inhibited from further development. The longer this developmental sequence is allowed to continue, the more generalized the deficits will become, seeping into more and more areas of cognition and behavior. Or to put it more simply – and sadly – in the words of a tearful nine-year-old, already falling frustratingly behind his peers in reading progress, "Reading affects everything you do"
Bahr, Peter Riley. (2007). Double jeopardy: Testing the effects of multiple basic skill deficiencies on successful remediation. Research in Higher Education, 48, 695–725. Rigney, Daniel, The Matthew Effect: How Advantage Begets Further Advantage, Columbia University Press, 2010. Stanovich, Keith E. (1986). Matthew Effects in Reading: Some Consequences of Individual Differences in the Acquisition of Literacy. Reading Research Quarterly 21 (4), 360–407. Stanovich, Keith E. (2000). Progress in Understanding Reading: Scientific Foundations and New Frontiers. New York: Guilford Press. ^ Adams, Marilyn J. (1990). Beginning to Read: Thinking and Learning about Print. Cambridge, MA: MIT Press.